Brian Eno and Danny Hillis are long time friends and collaborators. Eno is an influential British musician, producer and artist known both for his work with some of the biggest names in rock as well as his identification and popularization of ambient music. Hillis is an American inventor, scientist, author, and engineer known for his work as one of the key inventors of parallel computing. It was at MIT that Hillis developed The Connection Machine, the first massively parallel computer, with the help of physicist Richard Feynman. It made use of over 60,000 microprocessors and helped lay the foundation for modern supercomputer architecture. He’s since worked as an Imagineer at Disney, co-founded a research and development company called Applied Minds and spoken at multiple TED events on cancer research and the need for a backup internet. As the creator of some of the world’s fastest computers, Danny Hillis has helped “enforce” Moore’s law but also to question its effects. Faster and faster computers may help us with certain problems, but they can’t tell us which problems to focus on; instantly available information gives us new insight into the present, but can’t necessarily help us see where we’re going. In mulling over these problems, Hillis sought a way to encourage long-term thinking beyond the newest technological developments and earnings reports. It was only a year later, in 01996, that Danny Hillis and Brian Eno, along with Stewart Brand and others, turned these conversations into action by forming The Long Now Foundation. In a few more years, Stewart Brand’s book The Clock of the Long Now: Time and Responsibility outlined the guiding philosophy that had been developed in those conversations. It includes an anecdote from Eno about how he came to coin the Clock’s (and the Foundation’s) name: Eno was astonished by the contrast between an acquaintance’s opulent loft and run-down neighborhood. I realized that the “here” she lived in stopped at her front door. This was a very strange thought to me. My “here” includes the neighborhood at least. After that, I noticed that young arty New Yorkers were just as local in their sense of “now.” “Now” meant “this week.” Everyone had just got there, and was just going somewhere else. No one had any investment in any kind of future except their own, conceived in the narrowest terms. Eno recounted this story and expanded on his thoughts around “The Long Now” in the first of the monthly Seminars About Long-term Thinking. He later appeared with SIM City creator Will Wright to discuss the fun and aesthetic potential of generative systems. 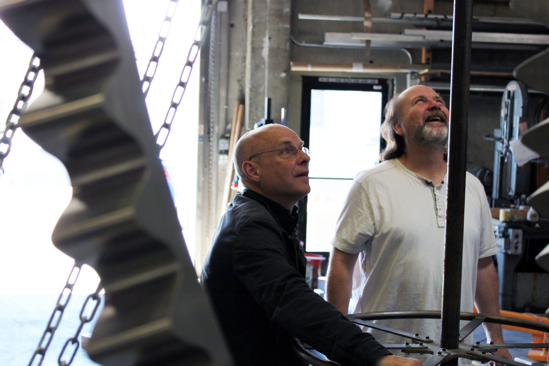 That love for generative systems influenced Eno’s involvement in the design of the Clock of the Long Now. He has guided the clock’s sonic component – its chimes. Bells and chimes, in fact, were central to an early form of generative music called change ringing. In that spirit, Eno collaborated with Danny Hillis to ensure that visitors to the Clock will have the opportunity to hear it chime 10 bells in a unique sequence each day at noon. I wrote to Danny Hillis asking whether he could come up with an algorithm for the job. Yes, he wrote back, and in fact he could come up with an algorithm for generating all the possible algorithms for that job. Not having the storage space for a lot of extra algorithms in my studio, I decided to settle for just the one. 10,000-Year Clock: Chime Generator Prototype from The Long Now Foundation on Vimeo. At the Palace of Fine Arts on January 21st, Eno and Hillis collaborate once more to celebrate the first decade of Long Now’s monthly Seminars About Long-term Thinking, and to usher in the second.